House Leader Dinesh Gunawardane warned Speaker Karu Jayasuriya not to violate the provisions of the Constitution by taking a partisan stand on the current political situation. Mr. Gunawardane is reported to have said this at a meeting of the political party representatives. He said the President acted according to the Constitution in proroguing Parliament, and that power could not be challenged. He warned the Speaker of repercussions of violating the Constitution. Is this some sort of a threat? a Dog barks but mountains will not collapse. The height of a leech's leap ! Behaving like a STREET DOG . Boralugoda Boru Hero, ha ha ha. shame on you being a part for robbing a government. Mr.Dinesh, got and beg your vote from streets and people will kick you during next election, remember that, because you don't know how to speak. 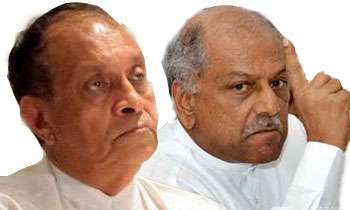 Mr. Karu, UNP must seek a person to field in the Presidential elections after General Elections was over. Wait. You may have to face the consequences for threatening him.